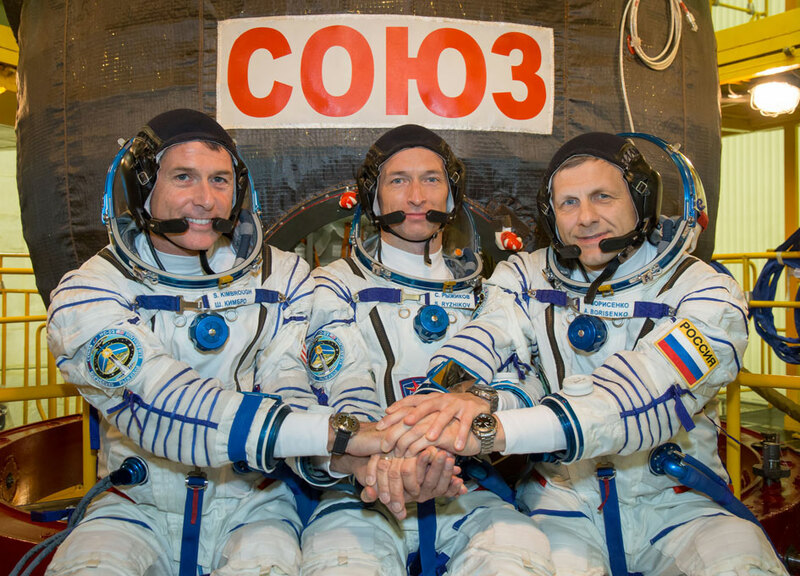 Expedition 49-50 crew members (from left) Shane Kimbrough, Sergey Ryzhikov and Andrey Borisenko pose for pictures Sept. 9 in front of their Soyuz MS-02 spacecraft. Credit: NASA. After reviewing the documents on operations that were carried out to repair the technical malfunction of the Soyuz MS-02 manned transport vehicle (MTV) the State Commission resolved that the space ship may be launched to the International Space Station (ISS). Based on quality assurance tests of MTV Soyuz MS-02, the specialists of Rocket and Space Corporation Energiya determined that the control equipment was activated by the landing system cable, which was jammed during the test operations. After the cable malfunction was fixed, engineers ran a full trial of the space ship. Based on trial results, the Commission resolved to launch MTV Soyuz MS-02 (decree #732) on October 19, 2016, at 11:05 AM MT. The launch of Progress MS-04 cargo spacecraft will take place on December 1, 2016.